Science experiments with raw eggs and vinegar can be a fun and interesting way for kids and students to learn about chemical reactions and osmosis. Vinegar is used to create a chemical reaction with raw eggs also known as the naked egg experiment. After completing the naked egg experiment, students can learn about osmosis, the process where water passes in and out of a semipermeable membrane. These experiments use simple household items, making for an affordable science project. To complete the naked egg experiment, you will need a raw egg, a tall, clear glass and a bottle of vinegar. Carefully place the egg into the glass and pour on the vinegar until the egg is covered. Within the first few minutes you will see bubbles forming on the surface of the egg and rising to the top of the glass. Leave the egg in the vinegar and put it in the refrigerator for 24 hours. After 24 hours, carefully discard the old vinegar, pouring on fresh vinegar and returning it to the refrigerator where you will leave it for one week. After one week, remove and rinse the egg. 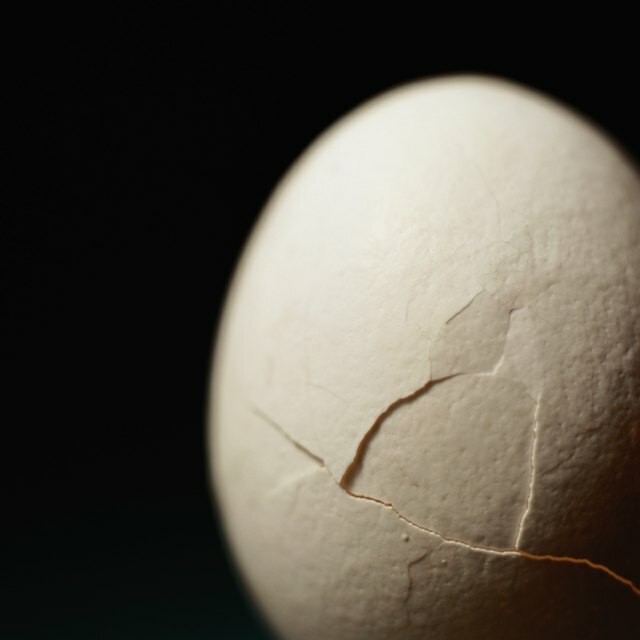 You will notice that the egg’s shell has completely dissolved, leaving a soft, rubbery translucent raw egg. You will also notice that some of the vinegar has permeated the egg’s membrane, causing it to increase in size. The naked egg experiment demonstrates a chemical reaction between the calcium carbonate in the egg’s outer shell and the acetic acid in the vinegar. The shell of a raw egg is composed mostly of calcium carbonate, in addition to magnesium carbonate, calcium phosphate and organic matter. The acetic acid in the vinegar literally dissolves the egg’s shell. As this chemical reaction takes place, carbon dioxide is released in the form of the bubbles you see in the glass. The carbon dioxide releases continually until all the carbon in the egg is gone. If you touch the egg after the first 24 hours in the vinegar, you will notice that it is soft because all the carbon has been released. To add a twist to your naked egg experiment, remove the raw egg from the vinegar and allow it to sit out on the table for one day. You will notice that the egg, that was once soft from the vinegar, is now hard again. The egg regains its solid structure as it takes in carbon from the carbon dioxide in the air. Once the vinegar has dissolved away the shell from the egg, it is now primed to experiment and observe the process of osmosis. Place the shell-less egg in a glass of water with a few drops of food coloring. You will see the colored water passing into the egg through the semi-permeable membrane via osmosis. The egg will expand and eventually burst if you leave it in the water long enough. You can also observe the opposite reaction if you place the naked egg into a glass of corn syrup. Because corn syrup contains less water than the egg, you will observe the egg releasing water, causing it to shrink in size. Maier, Casandra. "Raw Egg & Vinegar Experiments." Sciencing, https://sciencing.com/raw-egg-vinegar-experiments-8122302.html. 25 April 2018.